Swiss engineered and Italian-made to offer some of the most high tech running and sports socks available today. X-Socks develop each model with unique patented technologies. These ladies X-Socks Merino Isolate Trekking Socks are no exception, designed to replicate a ‘barefoot climate’ with their thermo-regulating and stabilising technology complementing the light, warm merino wool used. The patented X-Cross Bandage supports and stabilises ankles, while an elaborate arrangement of cuff to toe cushioning zones guard and relieve feet from the rigours of rough environments and unforgiving wear and tear on skin and muscle. The mix of natural fibres and patented technology elements is what X-Socks call a perfect combination of “nature plus function” with inbuilt ventilation systems to ensure dry feet and insulating chambers on the instep to warm arch muscles during cooler temperatures. 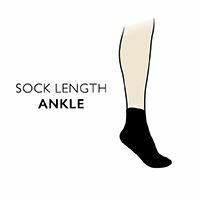 Ladies X-Socks Merino Isolate Trekking Socks are specially shaped, with a gender-specific fit, wide where it needs to be and narrower at the instep and heel.